With the latest work on OpenEVSE II, I've made some exciting (well, to me anyway) developments on the Hydra. 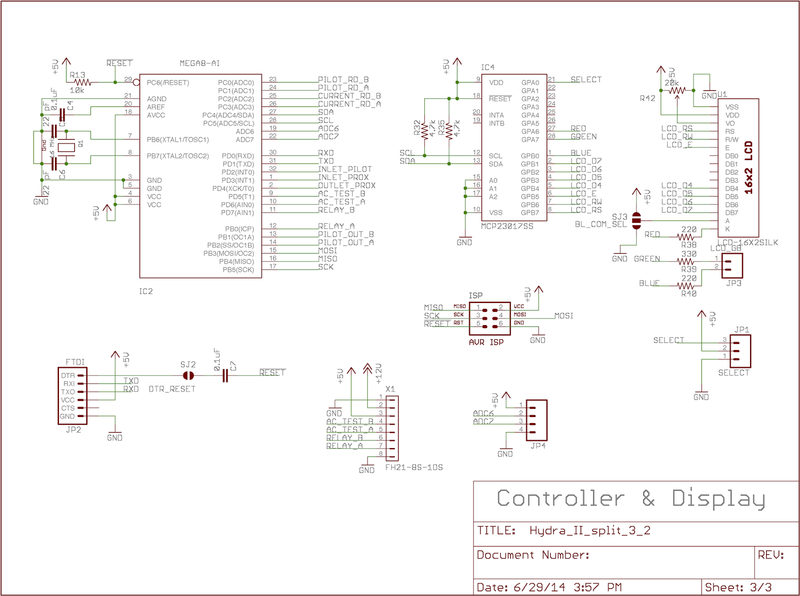 Hydra v3.2 unifies the PCB design - the "splitter" variant PCB was taken from the v3.2 EVSE variant design, and the splitter variant changes back ported from v2.2. Additionally, there's a new "mezzanine" board with all of the AC components. And there is also a new relay test system (also courtesy of OpenEVSE) that will report an error on the UI if the power does not turn on and off as expected with the respective relay. The AC board connects to either variant with an 8 pin FFC. The AC board has jacks for AC input, contactor coil outputs and two AC test inputs for the load side of each contactor. 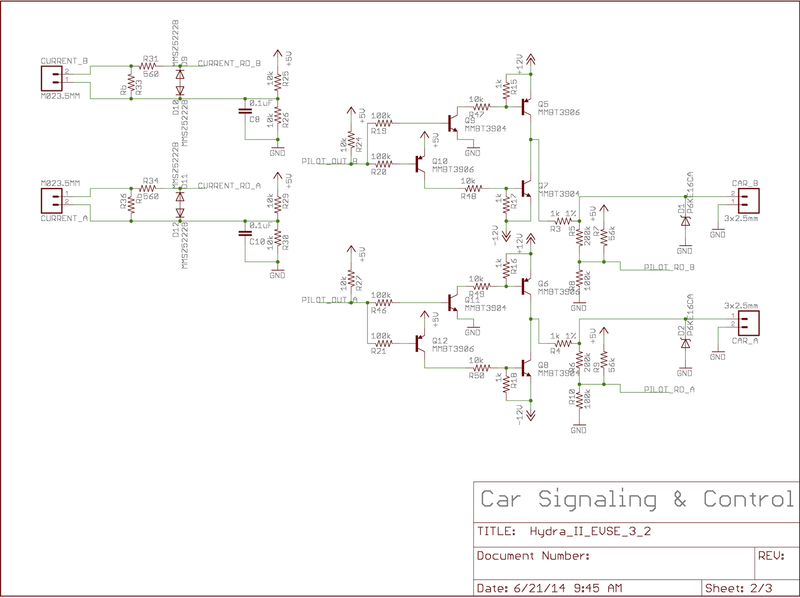 The logic boards have an FTDI port, ISP, a 3 pin connector for the UI switch and ammeter and J1772 connectors for each car. For the splitter variant, the per-car connector has pilot and proximity lines and there is an inlet pilot/proximity connector and a power switch connector. For the EVSE variant, the per-car connector has only pilot and there is a 3 pin GFI terminal and a CR1220 battery holder for the RTC chip. That's the AC board. It's the same for both variants. The actual board is the exact same size as the logic board and has standoff holes in the same locations. The idea is that you mount the logic/display board on inch-and-a-half standoffs above this one. Each has identical +5 and -12 volt DC-DC converter modules based on the MC34063 controller. Thanks for that go to Dave Jones over at EEVBlog. It was his video on the subject that introduced me to this chip. 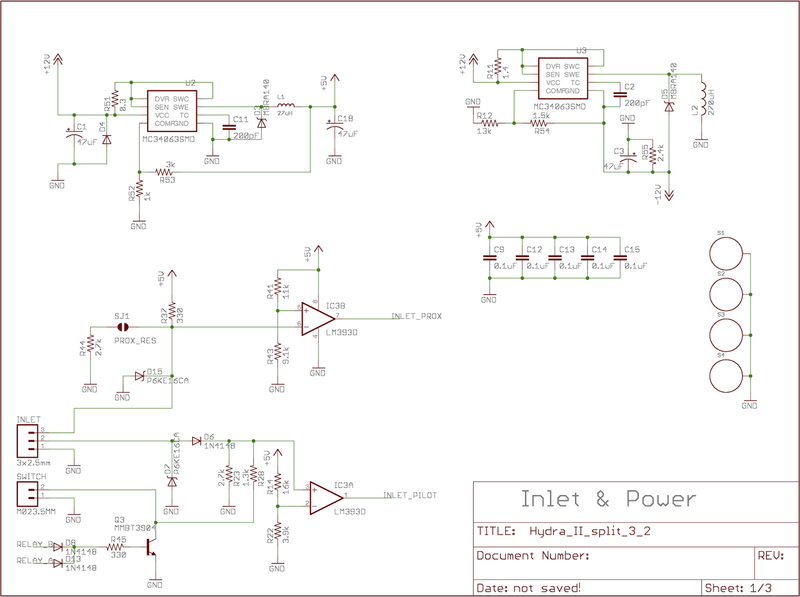 Other than a couple other designs that have had requirements beyond this chip's abilities, this chip has become my new one way to change DC voltages. 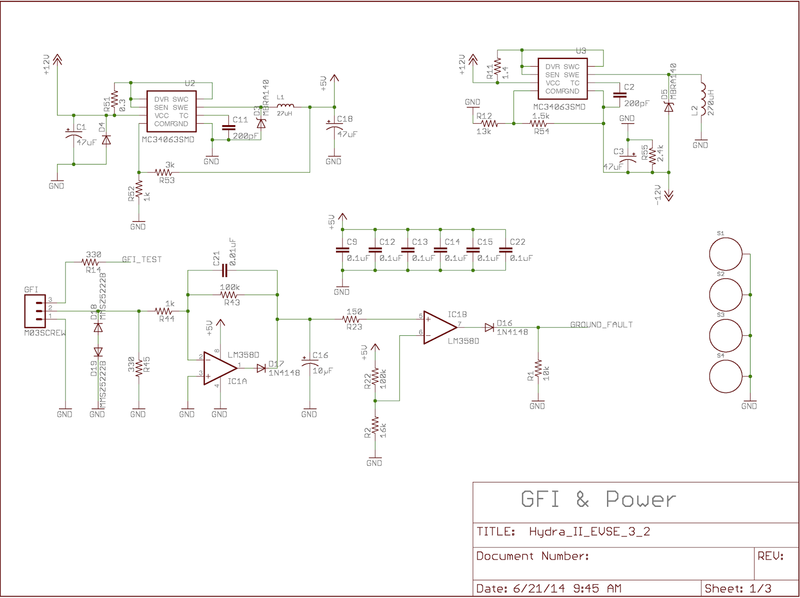 For the EVSE variant, the GFI circuit is from OpenEVSE (who in turn got it from a CR Magnetics application note), but with a couple of minor changes. OpenEVSE added a cap to the first feedback resistor, but theirs is 0.1 µF, which results in a roll-off for the low-pass filter that's too low. I've changed it to 0.01 µF. 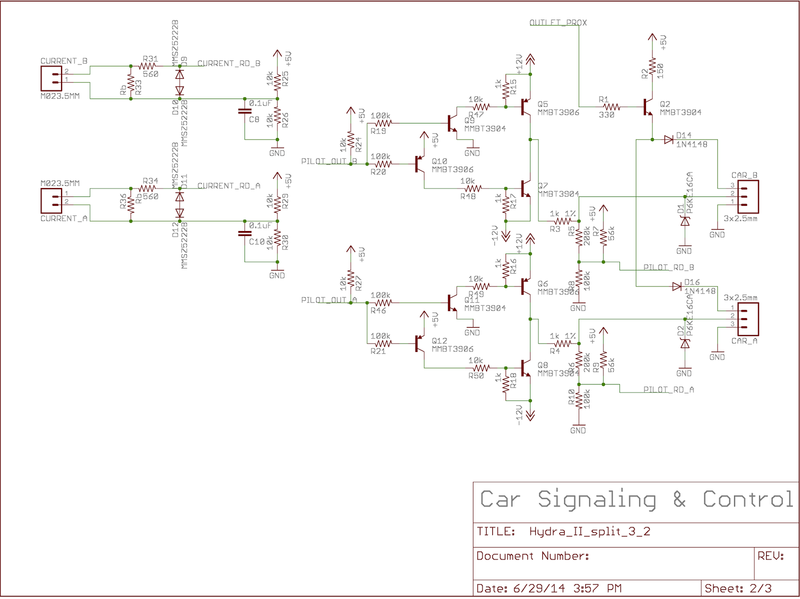 I've also reduced the voltage divider on the detection side, changing the 20k resistor to a 16k. This increases the GFI sensitivity. For the splitter variant, there's a proximity transition detector that looks for someone pushing the proximity button on the inlet. If your J1772 inlet lacks the 2.7k resistor to ground, then you should close the INLET_PROX jumper, which will supply a replacement. The inlet pilot is wired much like the spec indicates - a 2.7k resistor to ground (after the required diode) permanently anchors the inlet in state B. A 1.3k resistor can be added in two ways. First, the "switch" connector can be used directly to connect it to ground. 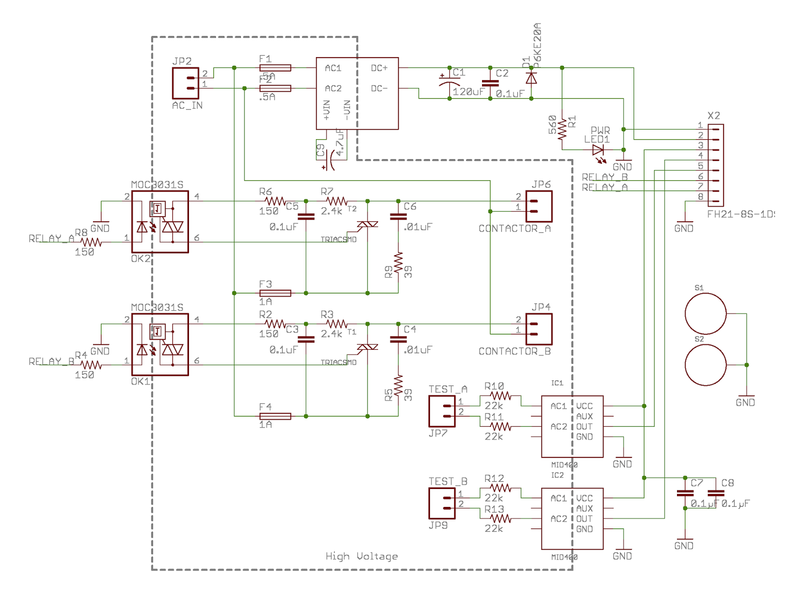 Alternatively, if either relay output is turned on, a transistor will ground it. The concept is that if you connect the AC power connector to 120 volt power supplied externally, then you can switch your EVSE on or off on demand. As before, if you supply AC power separately, then you should leave the switch connector open. If you simply connect the AC power input to the line side of one of the contactors (to take power from the inlet), then you should jumper the switch connector with a wire. The two car signaling sheets are almost the same. The only difference is the addition of the outlet proximity signal. The idea is that when the inlet proximity button is pressed, that same action can be repeated on each car to insure that a rapid removal of charge current happens to prevent any arcing. The only difference here is the addition of the RTC clock chip, battery and crystal for the EVSE variant, and the three digital pins that that change from GFI and GFI test to inlet pilot, proximity and outlet proximity. 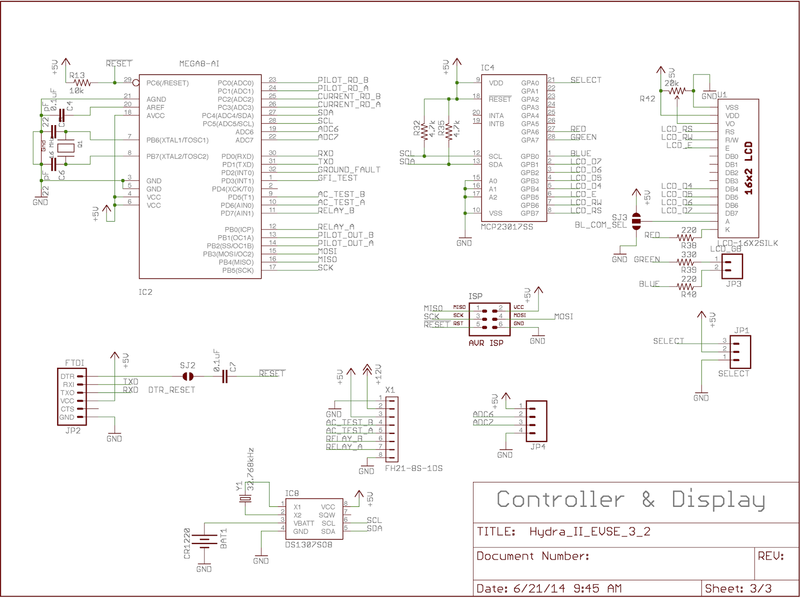 In each case, there's a two-way jumper for selecting the polarity of the common pin for the LCD backlight, and a jumper that allows DTR transitions on the FTDI port to reset the controller (which would allow a traditional arduino bootloader to upload sketches over serial). New to v3.2 is a 4 pin header to bring the unused analog input pins (ADC6 and 7) along with +5 and ground out for potential enhancements in the future.